Upholstery Sewing Services, Upholsterers Fife, Scotland. Visit our Blog for News and Comments. 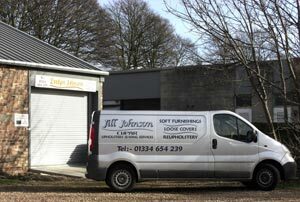 Fife upholsterers, upholstery repairs, furnishings and window dressings for commercial, home and caravan. 73 years combined upholstery experience and knowledge to ensure customer satisfaction and quality of workmanship. Upholstery Sewing Services was formed in 1990and has operated from Cupar, Fife up to the present time. We have recently moved to new purposely adapted premises in the middle of the town to make it easier for our customers to visit. During the past 19 years we have strived and succeeded in carrying out all manner of upholstery repairs, upholstery sewing soft furnishings, loose covers and window dressing for home, commercial and caravan to the utmost quality and cost effective solutions for all of our customers. We offer a full upholstery service including antique restoration, re-springing, re-covering of all soft furnishings, loose covers, caravan seat re upholstery, headboards, footboards, pouffes, foot stools, cushion covers, foam renewal and also contract out curtains, pelmets, valances, tie backs, blinds etc. We are prepared to travel anywhere to offer estimates and collect and deliver all work. Please contact for any cost involved out with our local areas. Please phone, e-mail or call direct to discuss any special needs, rush orders, special fabrics, antique furniture restoration etc. Copyright 2009. Upholstery Sewing Services.